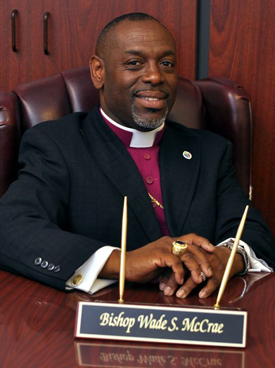 Bishop Wade S. McCrae, Presiding Prelate & Convocation Host, the son of Sally Walker and the late Tom McCrae, is a native of Tift County, GA. He received a diploma in Marketing and Management from Valdosta Area Technical School and later attended Devry Institute in Atlanta GA. Bishop McCrae received his Bachelors Degree in Biblical Studies and is presently pursuing a Masters in Religion and a Doctoral in Divinity from Liberty University. Bishop McCrae has been the pastor of Union Cathedral for the past 29 years. He was privileged to attend the Joint College of Pentecostal Bishops for three years (2005-2007). On October 7, 2006, he was elevated to the Episcopal office of Bishop by the Joint College of Pentecostal Bishops and is presently connected with the Joint College. Bishop McCrae is a duly consecrated Bishop with full Apostolic Succession in the Lord's Church. He is now Bishop of the Rhema Word Covenant Fellowship of Pastors of which he founded. The Fellowship is a connection of Pastors and Ministers who have willingly submitted to Bishop as their spiritual covering and mentor. Bishop McCrae is married to Dr. LaConya J. McCrae, also a native of Tifton, GA. He is the father of four: Brandon, Brittany, Tyler, and Immanuel of all whom he is very proud of.